The building had to compliment the landscape and be sympathetic to the natural surroundings. 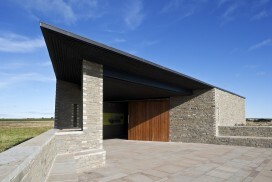 Natural England had specified that the building had to reflect the unique location and environment of Lindisfarne National Nature Reserve. Icosis had to find materials that would complement their architectural style and fulfil the specifications required by Natural England. In order to reflect the island’s rich natural heritage, Icosis decided to use stone and turf as their main building materials. Denfind Stone provided the perfect solution for the material required. The traditional stone was sympathetic to the environment and yet complimented the modern design of the building. As the stone is sourced from a quarry just meters from the stone processing plant, the carbon footprint for sourcing the stone is kept to a minimal level; making it environmentally friendly, and sustainable. This tied in with Icosis’ environmental ethos and Natural England’s specification. The stone is sourced from the quarry on site and processed just meters away in our production shed, making it environmentally friendly and a sustainable natural product. The stone is expertly quarried and cut by our craftsmen thus ensuring a quality building product. 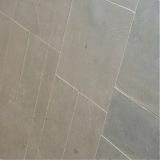 The attractive colour of the Pitairlie sand stone makes an aesthetically pleasing contribution to any structure, and it compliments other natural materials such as wood.